The Audi A8 is the World Luxury Car 2018. The win underscores the status of the brand’s flagship as the embodiment of Vorsprung durch Technik. The award ceremony took place today (Wednesday, 28 March) at the New York Auto Show. The Audi A8 is being built at the Neckarsulm site and has been available to order in the UK since December 2017. In addition to its select materials and handcrafted-level build quality, its highlights include high-end equipment like the HD Matrix LED headlights with Audi laser light, dynamic all-wheel steering and the relaxation rear seat package with foot massage. 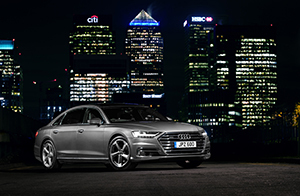 UK pricing starts from £69,100 OTR for the standard wheelbase model and £73,095 OTR the A8 L.